We have been checking out huge stacks of picture books from the library ever since starting our reading calendar. We have to keep our choices open! 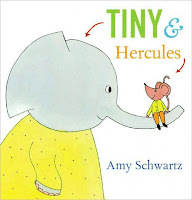 Our first choice this time was this simple book written and illustrated by Amy Schwartz called Tiny & Hercules. It's about Tiny (the elephant) and Hercules (the mouse). It is a series of short episodes which each end with one or the other of these friends being able to use their unique qualities to help the other. They go ice skating, run a lemonade stand, knit, paint and more. Z liked this book because it is so simple. He loved the opposite names and he liked the friendship between these two -- especially since he truly believes that elephants are afraid of mice. This one is also great for younger kids because of the short segments. The illustrations are a bit odd but the message of friendship is clear. The next picture book is Little Hoot, written by Amy Krouse Rosenthal and illustrated by Jen Corace. This is the story of a small owl that is sad each night when his other animal friends get to go to bed and he has to stay up and play. All he wants is a normal bedtime when the sun goes down. His parents try to keep him up, in preparation for becoming a grown owl, but he just can't do it yet. Besides having super adorable illustrations, this book has very simple words that will appeal to even the youngest kids. I'm not sure what exactly the message is (because Little Hoot doesn't actually stay awake at night like an owl should) but the cuteness of the book has won us over anyway. 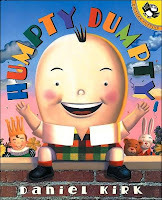 The final book of the bunch is Humpty Dumpty by Daniel Kirk (of Library Mouse fame). This twist on the classic nursery rhyme, still written in verse form, is the story of Humpty the boy. His mom entreats him to be careful because he is fragile but he likes to have fun and take risks. On this day, what he really wants is to go to the birthday parade of the boy king. He heads to the town with his friends just as the king, King Moe, is fighting his own mother because he is too nervous to go outside. As Humpty climbs higher to be able to see the parade, he falls off a brick wall and falls through the roof of the king's coach. Though all of the king's horses and all of the king's men are unsuccessful in putting him together, the king turns out to have fantastic puzzle skills and he is able to reconstruct Humpty before the two become fast friends. This was Z's favorite of the bunch. He loves well-executed rhyming books and this is definitely one of them. He also recently learned the rhyme in kindergarten which helped him enjoy the book even more. 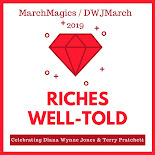 This is a bright and happy book. Support our site and buy Tiny and Hercules and Little Hoot on Amazon or find them at your local library. Humpty Dumpty is out of print so you will have to find it at the library like we did with all of these. Aww! I love Little Hoot! I could so see my Little One liking Humpty Dumpty. We'll have to look for it. And I love that Z firmly believes that elephants are afraid of mice. These are such cute pictures! Lenore - This was our first "Little" book and I definitely want to peek at the others. Passionate - I wish I had a new baby to be looking at books for!